I spent my non riding year looking for the perfect bike. reading, making researches on power / torque / reliability and visiting every used bike shop in the area. after a year, I decided on a 199... whatever kawasaki zephyr. I wanted one of those older boxy Z1000 but those I could find were in bad condition when the zephyr with 18.000 km on the clock looked perfect. Odlly I don't have too many picture of that bike. 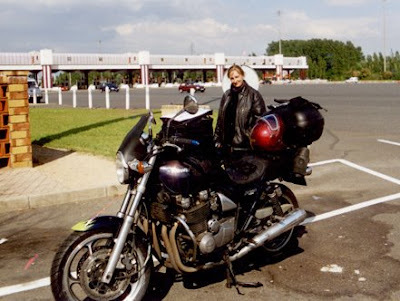 here is it on our way down to marseille and corsica, crossing what I considered as the toll between north and south. 10 minutes later an gigantic storm broke and almost drowned us. not that much more than the LTD but a lot faster. then I began to ride like frenzy. and soon the big old bike felt big and heavy and the ground clearance wasn't good enough. I'd put the exhaust on the ground on about every fast turn, and I didn't put too much confidence in the brakes at 200kph. the chassi itself would slowly undulate on straight line and franckly shake on fast turns. I had to put another engine in it after the 2nd gear broke. cost me a 4th of the bike. one day, coming to one of my 3 works, there was this big brand new flashy green bike. My boss had it lent by kawasaki belgium; He simply handed me the key saying "carreful the first km, let it warm up"